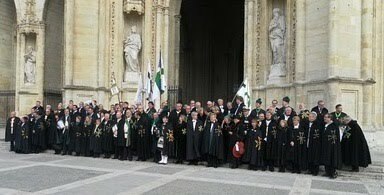 Members from France, the Czech Republic, the Netherlands, the USA, Spain, Italy and Great Britain gathered for the Chapter General of the Order at the Château de la Ferté Saint-Aubin, near Orléans, last weekend for the election and Installation of the 50th Grand Master of the Military and Hospitaller Order of St Lazarus of Jerusalem. The duly elected Grand Master is Count Jan Dobrzenský z Dobrzenicz, Grand Prior of Bohemia, and cousin of HRH Henri, Comte de Paris, Duc de France, the Temporal Protector of the Order. The Grand Master Emeritus, Prince Charles-Philippe de Orléans, Duc d’Anjou, Grand Prior of France, was present representing the Royal House of France, under whose protection, as the royal fons honorum, the Order exists. Our own Chaplain General, Fr Simon Henry, had the honour of proclaiming the Comte de Paris' declaration of his continuing protection of the Order under its new Grand Master and confirming the legality of his election. The Installation Mass took place in the medieval splendour of Orléans Cathedral. After the impressive procession into the Cathedral Holy Mass was presided over by the newly appointed Grand Prior Spiritual of the Order Mgr Pierre Boz, Patriarchal Exarch of the Melkite Greek Catholic Church for Western Europe, and we were warmly welcomed by the ebullient Rector of the Cathedral, Fr Claude Girault, the newly appointed Chaplain General of the Grand Priory of France. It was a wonderful occasion for all present and we have now definitively moved on from the difficult situation of the last few months. We now have a new Grand Master and a new Grand Council legitimated by the Constitutions and confirmed by the Temporal Protector. We can leave behind the events and personalities of the recent past and give witness to the world of our adherence to Christian values and the service of the poor. 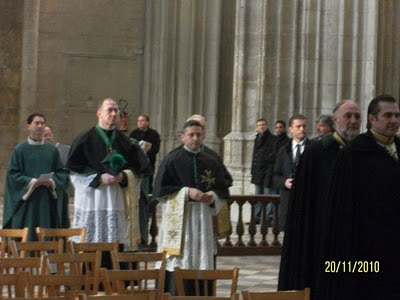 Here are a few photos of the Investiture Mass. More will be posted when possible.